Made with equal measures of love, skill and premium ingredients that include dark Valrhona chocolate, our heart-shaped chocolate butter cookies from Sweet Guy Cookies will charm your valentine. 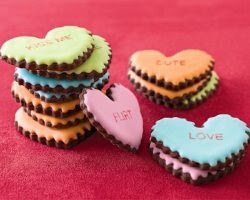 The cookies are prepared, rolled and cut by hand, then decorated in green, pink, aqua and orange and yellow icing, each stamped with the words “Kiss Me,” “Cute,” “Love” or “Flirt.” The 2 1/2" x 2" cookies arrive in a reusable tin. 7 oz. Set of nine." They are $22 and should be ordered by February 9th to ensure by Valentine's Day. Maybe I will send these to my husbands office for V-Day! These would also be cute as a favor for a wedding shower or engagement party.